Our programs tend to sell out in advance, so Reserve or Buy Your Tickets now! 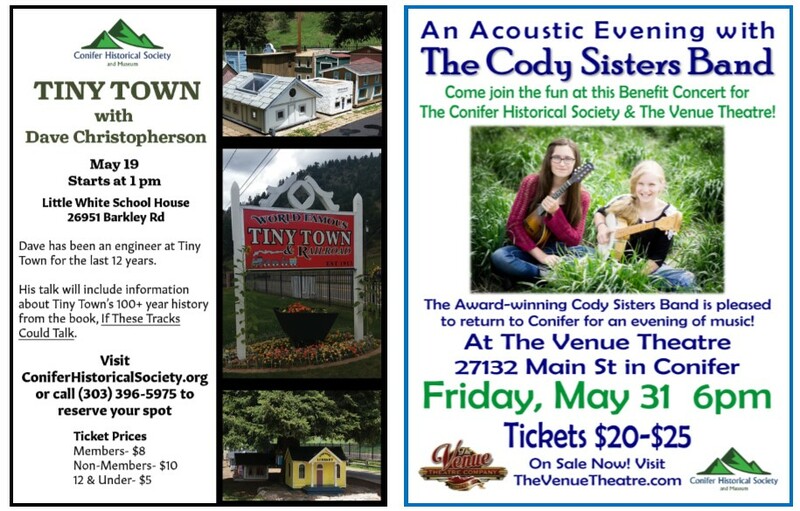 To purchase tickets for An Acoustic Evening with The Cody Sister Band Benefit Concert on May 31 at 6pm, please visit The Venue Theatre Here! Proceeds benefit The Conifer History Society and The Venue Theatre – an awesome way to support two awesome local non-profits! Come to a Bi-Monthly Meeting! of January, March, May, July, September & November at the Little White Schoolhouse. Members and the Public are welcome!